Digimorph - high-resolution X-ray computed tomography of skulls & fossils. Victorian Mammal Skulls - Victoria, Australia, that is. Comprehensive set of provenanced high-res. skull images of the entire mammal fauna. Bird Skull Collection - Superb collection superbly presented. 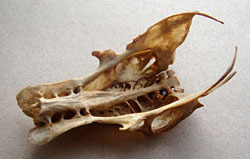 A real asset to the web, giving a realistic chance of identifying many bird skulls. Seabird Osteology - Comprehensive and authoritative. The Articulation Page - Reconstructing skeletons. Includes interviews with addicts. Michigan University Animal Diversity Web - student-authored pages on the world’s animals, many of the mammal species with skull photos. Mammal Society - Friendly invitation to take an interest in British Mammals. Index for Mammalian Species - American Society of Mammalogists monographs. Byzantine site architecture means you have to find the monograph number from the species lists, then click the pdfs icon to select your monograph from that list. Wikipedia - Many of the species pages are useful resources. Mammal Species of the World - Searchable checklist of the 4629 currently recognised species, with a taxonomic outline of each, and links to the Smithsonian's collections. Wikispecies - This project is intended to create a taxonomic checklist and, laudably, insists on Latin as its lingua franca. The apparent lack of recourse to a unifying authority makes me wonder whether it might end in tears.